I am a recent brain surgery survivor. I had a cavernoma resected from my optic chiasm a few short months ago. The doctors told me that I was going to go completely blind, but instead, I have lost only some of my vision. I am very blessed to still able to chase my son, drive, and even sew and crochet. I had some unexpected free time recently, and I decided to do some sewing. So much sewing that I decided to start an Etsy store, Blessed Not Blind Designs. 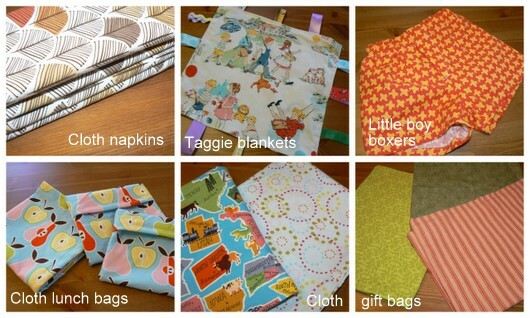 If you are interested in purchasing cloth napkins, taggie baby blankets, reusable cloth bags (gift bags and sandwich bags), little boy boxer shorts, or any of my other handmade items, come take a look! Each item sold also purchases a book for a child in need. Please contact me about custom orders or items you would like to see in my shop. The bags measure approximately 9" x 12" (red and green plaid) and 10" x 17" (red with gold paisley) and come with a ribbon to tie them closed. Kelly sent me a couple of bags to keep and a couple to giveaway, and I'll confess that I won't be wrapping any gifts in my bags except those intended for my own immediate family, so that I can reclaim the bags after the gift-opening takes place. For your chance to win the two cloth gift bags pictured above, simply leave a comment below. Be sure to include your email unless I can contact you through your commenting persona (Blogger profile, blog, etc.). Even if you don't win the giveaway, don't fret: Eco-novice readers receive a 15% discount off purchases in Kelly's shop -- just use the coupon code ECONOVICE. Make Blessed Not Blind Designs an Etsy favorite (you need an Etsy account to do this). You can enter the contest FOUR times total. Leave a different comment for each entry. Contest open to adults 18 or older and residents of the US. No purchase necessary. Void where prohibited. The number of eligible entries received determines the odds of winning. Giveaway ends Monday, November 14, 2011. Winner will be contacted Tuesday, November 15 and will have 48 hours to respond before I pick a new winner. While you're here, don't forget to enter my other giveaway: Handmade Gifts for Kids from Kidsstore. Disclosure: Blessed Not Blind Designs sent me two cloth gift bags to facilitate this review. All opinions are my own. Read my full disclosure statement here. Love the bags! You are very creative. Very lovely! We are big gift-givers, and having bags for that would be lovely. They are so cute, I would love to have them. Love giveaways! Thanks for the chance! These are great looking gift bags! They're perfect for gifts, but I agree- I'd have to give them to my immediate family so that I can claim them back! Thanks for the chance to win. What a great idea! I use cloth napkins and other cloth things, but I never thought of reusable cloth gift bags! these would be nice for my family's gifts. What an amazing attitude. And you create such beautiful things! It's inspiring, Kelly. I gladly favorited Blessed Not Blind on etsy as mercedesyardley! I like Eco-Novice on FB! There is so much waste around the holidays! These bags are such a great idea! I love supporting etsy. Love her stuff. I would love to see these bags sitting under my Christmas tree. Why have I never thought to do this?? What a great idea! I'd love to win! I added to my faves on etsy!